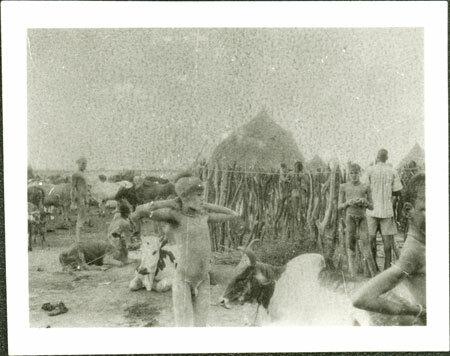 Ash-covered youths at a dry season cattle camp (wec) with tethered oxen sitting near to a fenced enclosure, and a cattle byre (luak) visible beyond. Evans-Pritchard notes that the ox in the foreground is rolnyang, which probably refers to a combination of white shoulder and forelegs (rol) with one horn trained across its face (nyang). In the far distance is what appears to be a river, possibly the Sobat. It was common as the dry season progressed for such camps to be sited next to permanent rivers as water became scarce. Note on print reverse ms pencil - "2 21 "
Morton, Chris. "Nuer cattle camp " Southern Sudan Project (in development). 03 Jan. 2006. Pitt Rivers Museum. <http://southernsudan.prm.ox.ac.uk/details/1998.346.21.2/>.